Fabulous 2,500 sq. ft. 2 bedroom 2 ½ bath adobe home in the midst of the historic eastside! This is the original adobe home of world renowned architect Alexander Girard. Enter the home through a grand salon/gallery with brick window seating overlooking the side garden. This home has the contemporary flavor that Mr. Girard was known for with curved lines and tile floors throughout. From the entry you will be welcomed into the formal living and dining room. There are built-in bancos around the fireplace and nichos which display stunning artwork. Adjacent to the living area is the gourmet kitchen with granite counters, gas stove and center island. Rumor has it that Georgia O’Keefe used to paint and sleep at this property. The large master suite with windows and doors overlook the gardens and views of the Sangre de Cristos can be seen peeking over the top of the historic Cristo Rey Church, the largest adobe building in New Mexico and designed by another famous architect, John Gaw Meem. The second bedroom is also an ensuite room with full bath and tile floors. There is nice privacy for the bedroom suites. 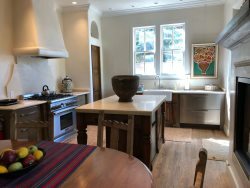 Doors in the home are original Girard artwork and an abundance of lighting creates a one of a kind living environment just two blocks from historic Canyon Road. The outdoor living space is a rare find behind these adobe walls. The gardens are spectacular and are maintained by a professional. Flagstone patios and covered portals are the perfect place to sit and enjoy the gardens and views. Forced air heating and newly installed refrigerated air conditioning. There is ample covered parking. No smokers please.